Polar Climate Facts | Cool Kid Facts . When you hear the word “polar”, you most likely think of polar bears or the North Pole. You might also think of freezing temperatures, snow up to your ears, and so much ice that you need ice skates to get around! All of this is correct. But there is so much more to polar climates than that! Where are Polar Climates Found? 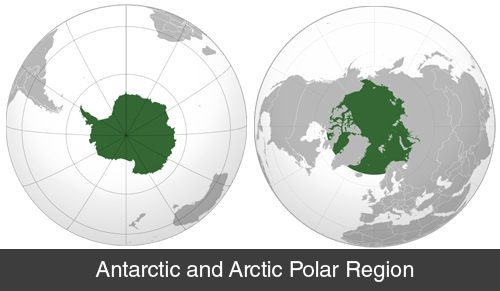 Polar climates are found at the very top of the earth, near Canada, Greenland, and Siberia, as well as at the very bottom of the earth, in Antarctica. Because these areas are so cold, there are not very many people living there. Would you want to live in a place where there is complete darkness for over half of the year?! What Type of Weather Do Polar Climates Have? 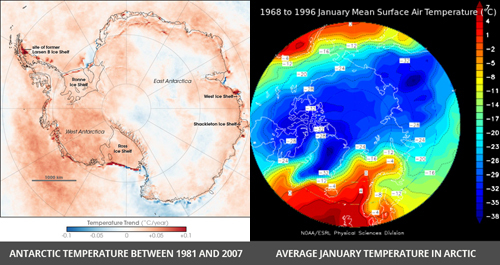 Polar climates are almost always covered with snow and have extremely cold temperatures. The temperature rarely rises above the freezing point and it often sits far below zero, way colder than the winters you might be used to! Because the sun is so far away from both the North and South Poles, areas in polar climates never have a chance to thaw out or melt. This means that ice in these places can be several miles thick. Now that would be one crazy ice rink! What Kinds of Animals Live Here? 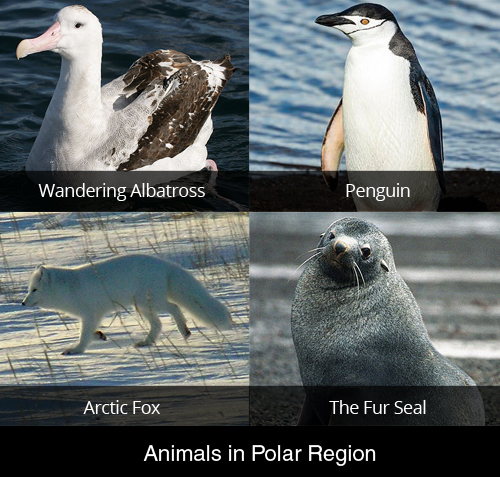 Since the weather is so so cold, there are not very many animals that live in these polar climates. Animals that do live in these areas have adapted over the years to be able to survive in freezing temperatures, tons of snow, and strong, blowing winds. The most well-known animal that lives in polar climates is the polar bear, a huge mammal that has a thick layer of body fat and a fur coat that is water-repellent to protect it from the freezing waters. They are amazing swimmers and use their large front paws to help them move in the water, much like how you use your hands to help you swim! Polar bears have a diet that consists mostly of seals because they need to eat large amounts of fat to survive. Another common animal that has learned how to survive in this cold climate is the arctic fox. The arctic fox is a carnivore, or an animal that eats meat, that mostly eats small rodents, such as lemmings. It relies on these to survive because it lives inland, away from the coast and water. If the food it usually eats starts running out, it will move closer to the water and hunt sea birds, fish, and other marine life. It has a thick fur coat that is white, which helps it to stay warm as well as hide from predators. Imagine your thickest and warmest winter coat and that is what the arctic fox’s fur coat is like! There are many things that threaten the polar region, but the biggest of these is climate change, which is when the temperature of the earth gets hotter. As the temperature of the earth continues to rise, the ice in the polar areas melts, which makes the land and coastlines get smaller. Think of it as ice in your glass of water melting. Since this is where polar bears, seals, and other animals in this climate live, they are losing their homes and their entire species is being threatened. Penguins, that live in the Antarctica region, are also losing their environment as the polar ice caps melt. Another threat to the polar climate is overfishing. Overfishing is when humans take fish out of the water faster than they can reproduce and grow. This causes a less fish in the water and doesn’t allow them the time they need to naturally complete their life cycle. Some types of fish have been so overfished, that their entire species is in danger of becoming endangered or wiped out completely. Pollution of the waters in polar regions is another threat to the lands and animals that live there. Whether it be garbage, oil, gas, or other marine debris, this is causing horrible effects on every type of animal both in the water, and those that depend on the water. Marine life can get tangled in garbage that is floating in the water and polar bears are affected when they eat fish that have been polluted. Humans can also be infected by toxic chemicals when they eat food that is from these areas. The polar climate is full of wildlife, extreme weather, and unique landscapes. These areas of the world may not be inhabited with many people, but they are vital to our ecosystem and world as a whole. The strong animals that have adapted to this severe climate play an important role in nature and have proven they can withstand the coldest of temperatures. The polar climate is an amazing part of earth that needs to be respected and protected.